Just 6 weeks to go before the Thames Path 100-miler and despite having almost no clue how to train properly for it, the one thing that seems obvious is getting time on feet. I thought I'd take advantage of a chance to visit the folks in Leics and take in the Charnwood Marathon on the Saturday and the Loughborough half on the Sunday. It seems slightly selfish to spend most of the weekend away doing my own thing, returning only for a square meal and a pint down the local.. but.. 100 miles! I thought I'd add a bit more stress to the legs and bash out a reasonable pace 10 miles on the Friday as if there's one certainty it's that the legs are going to be tired for the vast majority of the big race. 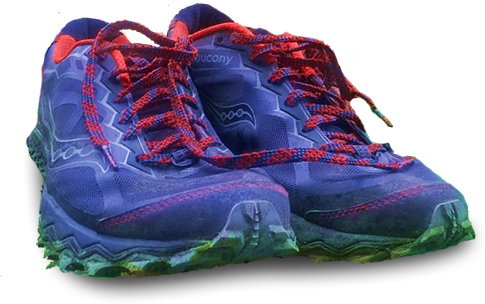 As usual I'd forgotten half the kit I intended to bring - hat, gloves and even the insoles of the trail shoes all missing! I wasn't about to run a marathon on the seams so reluctantly went for a battered pair of Kinvara 3s instead. The Charnwood Marathon is one of those gems of races that eschews commercialism and the incredible price inflation that besets our sport. You don't get a medal or a goodie bag or a tshirt or all that fluff. 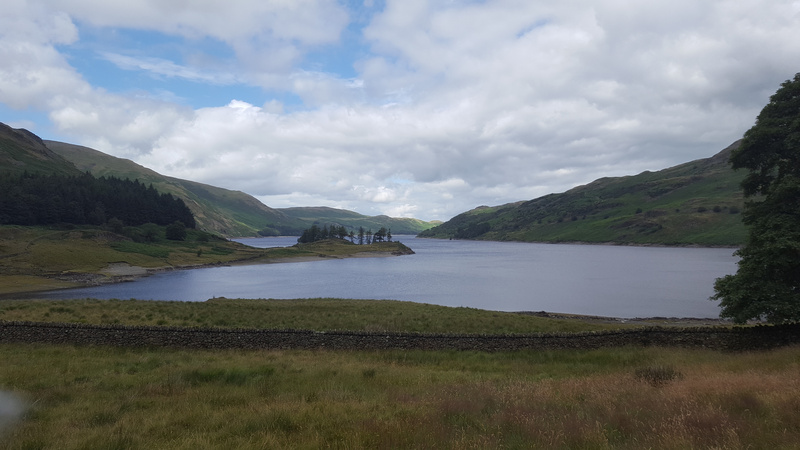 Instead you get what you came for - a well-organised run through some great scenery. And it's just a tenner ladies and gentlemen! Part of the payback is that you have to do the navigating yourself but with all LDWA events, and those like this that are non-LDWA but promoted on their site, you'll get extremely well fed during and after the race. As usual I bump in to some of my fellow Comrades runners going back for the Down in June. This time Emily and Jacquie. Now I was thinking I'd set myself quite a tough weekend but it paled into insignificance when Jacquie told me this was the 5th marathon she'd run this week! Now you're as young as you feel and all that but Jacquie isn't 25. 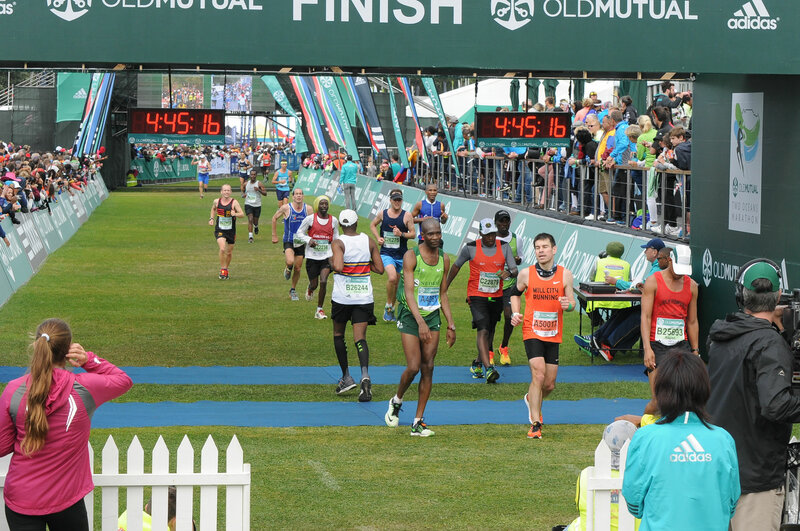 She brought her daughter with her (who may actually be 25) who only started running last January but has racked up 19 marathons since then and is also in for Comrades. So I don't know what they're drinking.. It's a 9am start for the runners, the walkers left an hour earlier, kicked off by a town crier who warns us to stay off the golf course before ringing his bell a few times and sending us off. I'd downloaded the 5 pages of route instructions but also been super clever and backed it up with a GPS map on the watch. Tricky to find the latter - someone had posted one on an online run logging thing from a few years ago - and this type of event seems to regularly change details of the route for kicks. I should have noticed the GPS map didn't actually start or finish where we were clearly starting and finishing and alarm bells should have rung. I'm not going for a time so set off at an easy pace and we're soon passing through Woodhouse which has a chocolate box aesthetic up to the first self-clip checkpoint at 4 miles or so. There aren't timing mats but at some checkpoints you'll find a friendly chap to clip your route card and others where you have to do it yourself. For some reason I can't fathom they also gave us a numbered disc which was to be dropped at the second checkpoint. They were at very odd intervals too with some only a couple of miles apart. I quite liked the randomness of it. It's tempting to dispense with the overhead of reading the instructions when you can see runners streaming ahead of you and sure enough I did just that. Fortunately I glanced at the watch out of habit which made me check the instructions after all. Those runners were all streaming back to the start instead of up Beacon Hill which if you've run up Beacon Hill is understandable. By the time I'd triple checked it with others coming up behind they were out of earshot and we couldn't call them back. I wonder what became of them. Maybe they're still going? Slogging up the hill we're rewarded with the first of many great views out over the countryside. For the next few miles walkers who left an hour ahead are reeled in, all very cheery and generously giving the runners the path. It's pretty flat up to the 3rd checkpoint at Mount St Bernard Abbey 11 miles in. By this time I've decided I'm hungry and tuck in to the cake. We're heading towards Bardon Hill only a couple of miles ahead and it's pretty much all on tarmac and through housing estates which is hard on the legs after such soft terrain so far. 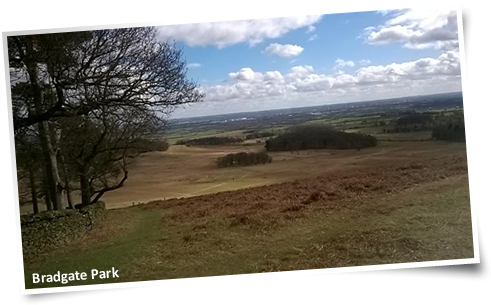 The climb up to Bardon is a tough one and this is the highest point in Leicestershire - no Everest at 270 metres above sea level, but it's a lung buster to summit. There's a huge quarry down below which scars the landscape but is impressive in its own right - a terraced pit as deep as it is wide. It's only a couple of easy miles to the next manned food point though we were lucky it's been a dry couple of weeks. There's enough residual bog to show this route would have been another swamp not long ago and several other runners said they'd recced it recently and the water was mid shin level. So grateful for at last having a dry run! More cake and filled rolls heave into view at 15 miles and this time I decide to basically have lunch and make the most of it. It turned out later that volunteers make all the food for free (and marshal the race of course) which is extremely selfless. All the entry money goes to charity. What a great bunch of people. 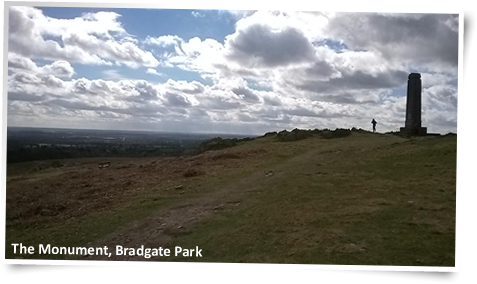 There's some very pleasant miles with the mild Spring warmth of the sun and lovely soft trails to Newtown Linford and into Bradgate Park which is a real gem of a place. I'd hoped we'd get to run through it but the route heads past the ice cream shop I used to go mad for as a kid (liquorice flavour my favourite) directly uphill to the monument and then Old John. I couldn't resist taking a few photos here as the view in the sun under backlit cumulus clouds deserved savouring. Old John's unmanned checkpoint was just over 20 miles in followed by a plunge down the slope to the next manned point a mile later. Yet more cake put away and only a few miles to go. I'd lost sight of everybody around me by now.. I'd been with a group up to the monument but completely lost sight of them by the time I'd taken my fill of the scenery. I went wrong almost immediately after the CP and managed to give myself an extra half mile to do having to retrace. Turns out I went wrong again shortly afterwards.. on course according to the GPS, and it seemed to match the written details too (but then that's all 'cross this stile, that field' so could match almost anywhere). Someone shouted from the road but I was away at the top of a hill and not sure they meant me so decided to ignore it and carry on. There's only a handful of miles to go anyway and who cares? My version passed by the heritage railway line to Quorn and a vintage steam locomotive and carriages passed right alongside the trail as I picked my way through the footpaths. I got lucky here too as there was a lot of very near total bog which would have been horrendous a few days back and maybe that's why it wasn't used - it sounded like I had the more scenic route versus the official one. The footpath emerged back into Quorn and in another half a mile my GPS beeped and cheerfully announced I'd arrived but there was no sign of the venue. I had to ask for directions in the end and I'd added another 3/4 of a mile to the total by the time I found it. But again.. who cares? This was abut getting time and distance on the feet not racing. Back at the community college there's rolls, hot soup (4 varieties!) yet more cake, oceans of tea and other drinks and I filled my boots gratefully. It was a really good day out with some testing gradients, fabulous scenery and a decent distance. I'd headed off after sticking around and chatting to other runners for a good hour or so wondering how the legs would be tomorrow for the Loughborough Half but feeling pretty good!